Leon Parent was the son of Edouard (manufacturer) and Jeanne (nee Gregnon) Parent of Ste. Agathe de Monts, Quebec. The family was Roman Catholic. He had three brothers, Gilles, Claude, and Robert, and one sister, Claire. Their mother and one brother died at childbirth on March 17, 1931. Leon indicated he spoke French with a little English. "Francais couramment, un peu l'anglais." He was a student at the time of enlistment in August 1941 in Montreal. He indicated he liked to play hockey and tennis, plus swim. He smoked 15 cigarettes per day, but said he did not consume alcohol. At that time, he stood 5' 11 1/4" tall and weighed 155 pounds. He had a medium complextin, blue eyes and brown hair. In his RCAF Service Book, Parent wrote that his birthday was June 5, 1922. At 3 ITS, Victoriaville, Quebec: January 18, 1942 - March 28, 1942: "Fairly intelligent, serious, hard worker, dependable, good sense of duty, sincere." At 11 EFTS, Cap de la Madelaine: April 12, 1942 - July 4, 1942. At 13 SFTS, St. Hubert: July 5, 1942 - November 6, 1942: "Above average pilot. Could have done better in GIS. Bound to improve with experience." Here he received his Pilot's Flying Badge and commission on October 23, 1942. He was rated suitable for Fighter Pilot. He was sent to Halifax on November 11, 1942 and was at the RAF Trainees Pool by November 19, 1942. By February 1943, he was taken from 3 PRC to 17 (P) AFU. From there, he was sent to North Afrrica June 27, 1943, returning to the UK by September 27, 1943. 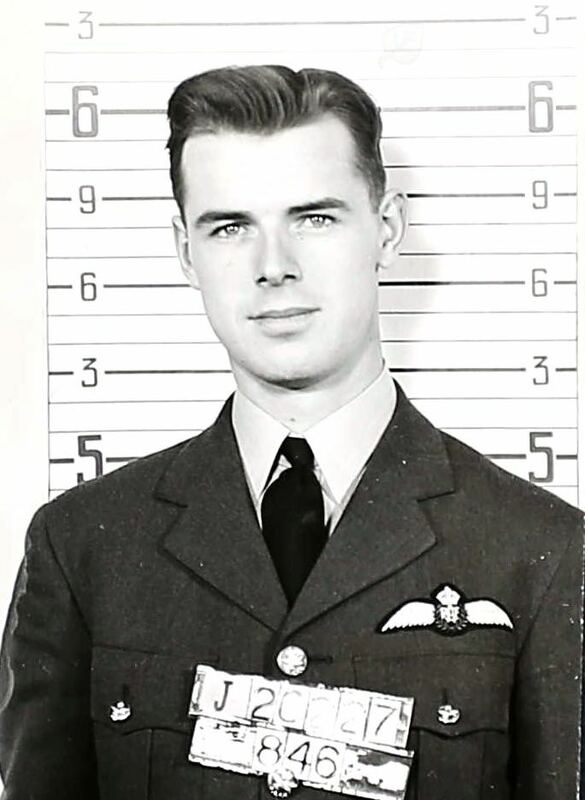 He was sent to 263 Squadron January 10, 1944. At No. 17 (F) AFU: February 19, 1943 - March 30, 1943: "An average pilot with no special faults. He will require more dual before flying solo at night on Master aircraft as he has not had the opportunity owing to lack of completing his night training at this unit." At No. 41 OTU: March 31, 1943 - May 25, 1943: "An average pilot whose overconfidence and inclination to carelessness will need careful watching." On June 7, 1944, Leon Parent was reported missing from an operational sortie against enemy shipping on the NW coast of France near St. Malo, flying Typhoon MN 515. He was seen to bale out and land in the sea only 500 yards from shore, but it was not possible to obtain further news. 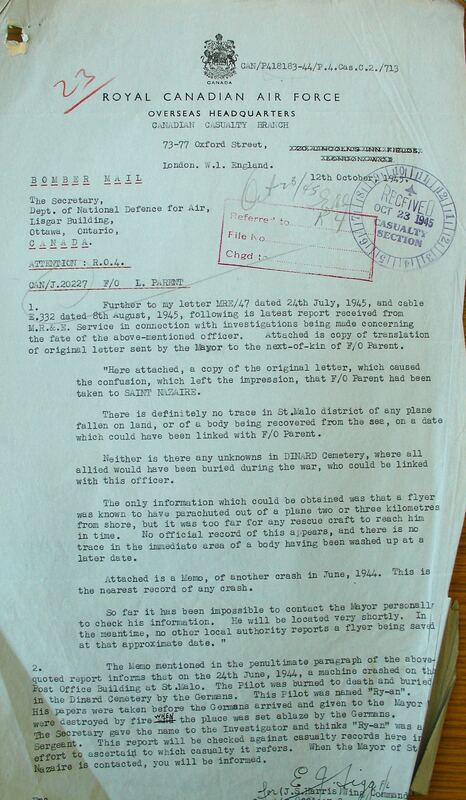 On June 9, 1944, the Squadron Leader wrote to Mr. Parent. "'Joe', as he was affectionately known by all members of this squadrion, joined us last January and I know I shall be speaking on behalf of everyone of us when I say he will be missed by us all, but we have good hope that he is alive and well." In October 1944, Mr. Parent wrote to the Mayor of the community where his son was seen to bale out. 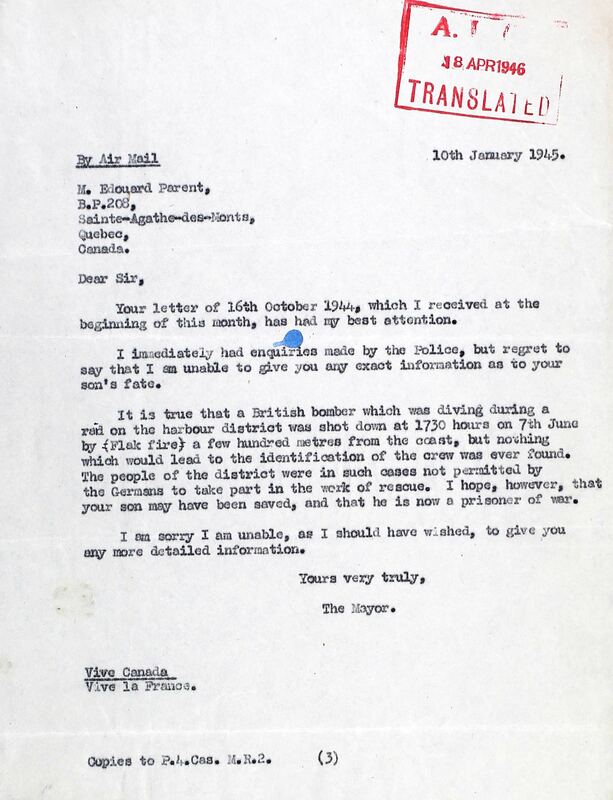 The Mayor wrote back, "It is true that a British bober which was diving during a red on the harbour district was shot down at 1730 hours on 7th June by Flak Fire a few hundred metres fro the coast, but nothing which would lead to the identification of the crew was ever found. The people of the district were in such cases not permitted by the Germans to take part i the work of rescue. I hope, however, that your son may have been saved, and that he is now a Prisoner of War. I am sorry I am unable, as I should have wished, to give you any more detailed information." In a Post Presumptive Memorandum: F/O L Parent. "LOST AT SEA. 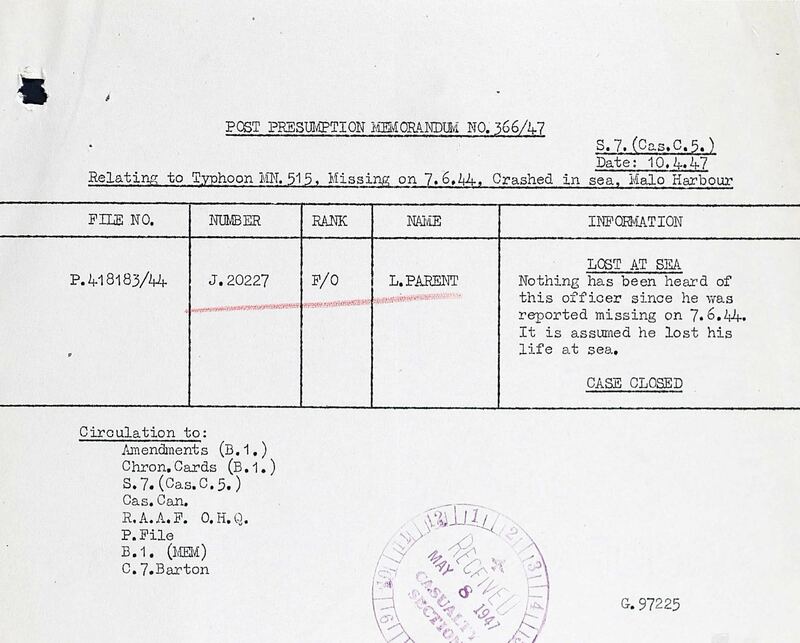 Nothing has been heard of this officer since he was reported missing on June 7, 1944. It is assumed he lost his life at sea. CASE CLOSED."